Nick Dekker raised the question of CO2 emissions per capita. China’s emissions per capita are higher than the UK. Since 2014, this gap will have grown. The oil rich Arab states head the list by a long way, yet these are not even classified as “developed” countries under the Paris Agreement or UNFCCC accords. It is particularly interesting to note the ranking of Norway, well above the UK, despite their abundance of hydro power and reputation. Seeing as UK is 54 out of 60 I’d lay odds that Claire Perry would argue that we’re not doing enough. Actually, 54 out of 220 nations. The whole table is not shown although it is in the link. For some nations, we see the result of something called “regrettable necessity.” I was in Toronto recently. The heat was turned on full, everywhere, for the simple reason that an Arctic “cold wave” had worked its way down*, and five million people would have died if the power had failed. Northern China is another place that is extremely cold in winter. By way of contrast, most of India can largely get by without domestic heating. Compared to 50 years ago, the profligate use of power in North America has greatly lessened. Back then, it was normal for offices to be heated to 80 F in winter – and the air to be bone-dry. And cooled to 60 F in summer – and the air to be sopping wet and chilly! As a visitor, one immediately developed a filthy cold, whatever the season. *Which is nothing new! It happens every winter. A complex description which I do not pretend to understand in detail, but may come to destroy the climate catastrophists’ alarmism, not before time. An amusing table that doesnt really mean much. Since we know co2 emissions have virtually no impact on climate and are beneficial to nature, its really a matter of what else is in the carbon emissions. If they are heavy with soot and particulates they may well be environmentally harmful; if Co2 then no problem. Does show that energy efficiency and waste is more a matter of economies of scale and distance than climate. No scale in luxembourg or the falklands. Yes, see above and in “wattsupwiththat,” Monckton, 30 March, 2018. 1. Do the UK and German figures include wood burning in this table? Given that both are serious wood burners, as is France in winter, this may be missing along with other “biofuels”. 2. Norway sells carbon credits to Holland and others, do these trades come into the values? 2) Carbon credits also don’t figure – the CO2 emissions are purely from burning of fossil fuels..
Who makes the most? Let’s see per capita emissions vs per capita production. The United States makes 25% of the world’s stuff. We emit 15% of the world’s human produced CO2. See “wattsupwiththat” March 30, 2018, Chris.Monckton : questions CO2-AGW relatoonship. Posibly demolishes present received opnion.so carbon fotprint notions false. It is not easy to see how there is such a substantial discrepancy even accounting for the fact that Wikipedia is not 100% reliable; their data is based in turn on World bank data. I would tend to believe Oak Ridge over the World Bank. But it would be interesting if the data came with a level of uncertainty and how it was calculated. Then we might have some faith in the results. Pauls figures are in metric tonnes carbon, the Wiki data in tonnes carbon dioxide. Multiply the first by 44/12 (the difference in atomic weight) and you will get roughly the same results. There is aso the difference between the two data sets that one includes emissions from cement manufacture, the other does not. Hope that helps! Don’t forget Wiki’s is measured as tonnes CO2, but CDIAC is tonnes of carbon. 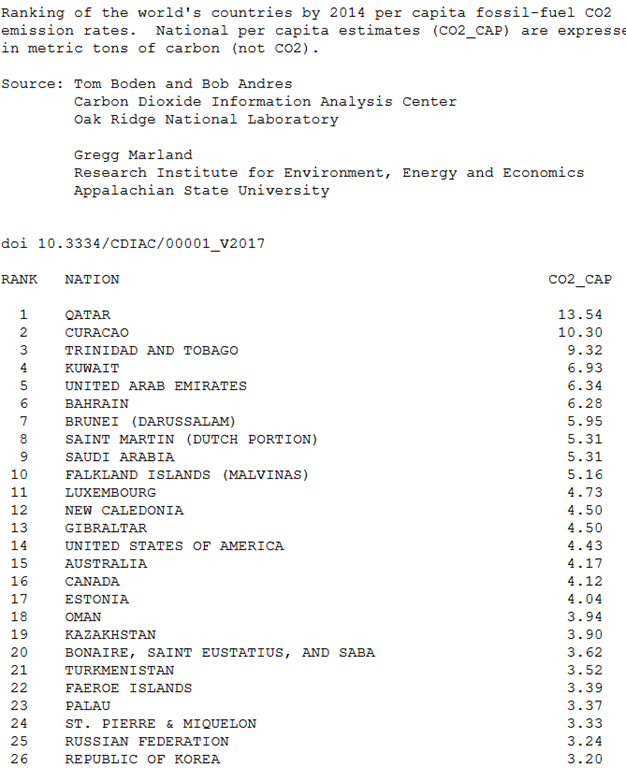 Paul, one of the reasons that small countries such as UAE (and Trinidad and Tobago) have high per capita emissions is that they are major oil/gas producers. Much of the emissions calculated are from flaring. That may explain why Norway has an unexpectedly high emission rate per capita. An interesting thought is that a substantial amount of the UK reductions over recent years could be due to less North Sea oil production. If that is the case, I wonder if the government, when quoting reduction figures, have made the public aware of this? 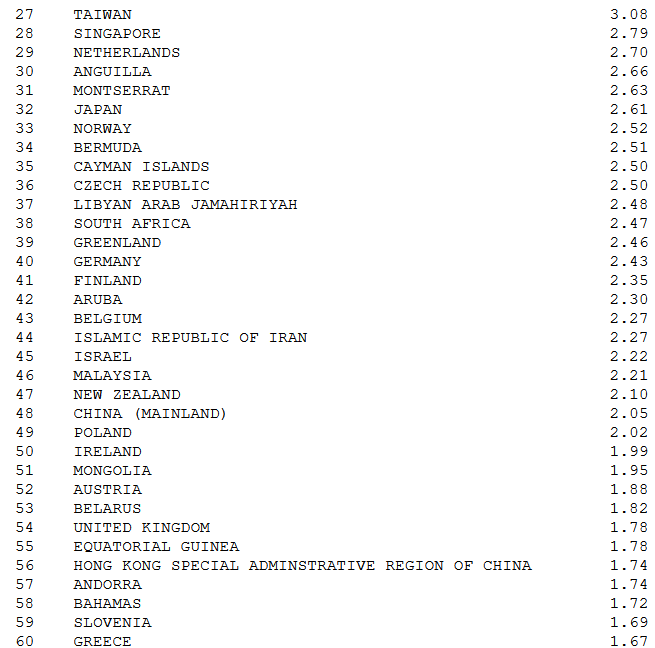 As another source of interesting information try using the CIA’s world fact-book, They have some interesting information on the breakdown of electricity generation by country. Luxembourg top for Europe! How do they manage that? Then Gibraltar. They make 2 million tonnes a year of steel. Most of it cannot be validated. In some countries you might be able to get stats for energy sales, but that is only part of the picture. If I switch to a log burner and chop my own wood, that doesn’t show up in the stats. What about imported electricity ? Flaring, probably you flare a lot more from new wells than old. And is it CO2 that matters ? The UK gov brags about emissions.. by which it means including other GHGs eg methane leaks etc. I might chop a forest and regrow it. but I might fill the same space with new roads/houses instead. I might be dumping a load of plant food in the ocean and actually reducing CO2 that way etc.